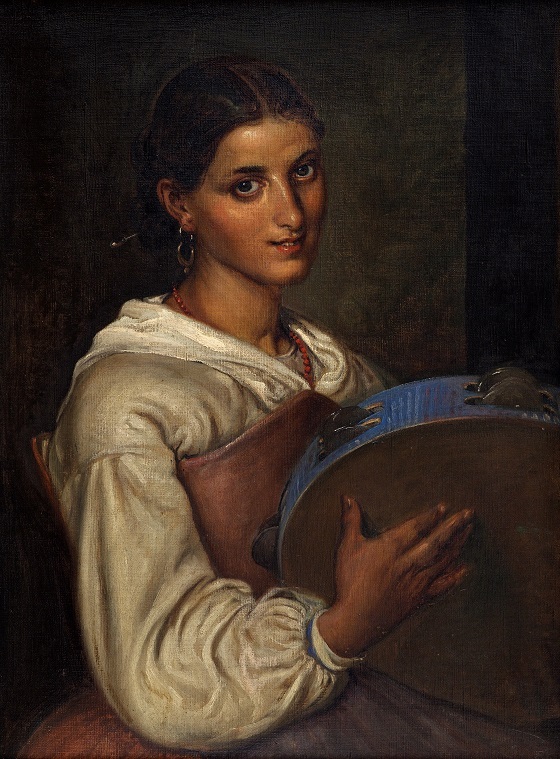 Italian girl with a blue tambourine, n.d.
Oil on canvas, 53 x 38 cm. A young Italian woman looks at the viewer with a somewhat insecure, but also inviting gaze. She holds a blue tambourine in her hand, which refers to her work as a musician, likely in connection with one of the numerous Italian festivals. Wilhelm Marstrand was captivated by the joie de vivre and light-heartedness that characterised these festive gatherings. In his art, he occasionally used the tambourine as a symbol of this lack of restraint and explicit sensuality with which the Italian women danced. After his return to Copenhagen, Marstrand also included a tambourine in the painting The artist’s wife and children in the studio in Charlottenborg from 1866 as a symbolic memory of the lively and sensual way of life he had seen and experienced during his time in Italy.